The game was played between the winners of two pre-designated semifinal bowls played on December 31, 2015: the No. 1 Clemson Tigers, who beat the No. 4 Oklahoma Sooners 37–17 at the Orange Bowl, coached by Dabo Swinney in his 8th season, and the No. 2 Alabama Crimson Tide, who shut out the No. 3 Michigan State Spartans 38–0 at the Cotton Bowl Classic, coached by Nick Saban. The 13–1 Alabama Crimson Tide won the game, holding off the undefeated Clemson Tigers 45–40 in the fourth quarter. Accompanied by a talented receiving corps, Clemson's Heisman Finalist quarterback Deshaun Watson had a historic performance, setting the record for most total yards in national championship game history, with 478 yards (405 passing / 73 rushing) against the nation's third-ranked defense in Alabama, breaking the record previously set by Vince Young in the 2006 Rose Bowl. Following the game, the AP Poll also named Alabama as its top team of the season, giving Alabama their fourth title in seven seasons. Both Clemson and Alabama finished the season 14–1. University of Phoenix Stadium in Glendale, Arizona was announced as the host site in December 2013, along with 2017 host Raymond James Stadium. The Arizona Organizing Committee, co-chaired by Brad Wright and Win Holden, hosted the game. The championship game marked the 16th meeting between the two schools. The last previous meeting was the season opener in the 2008 Chick-fil-A Kickoff Game. Alabama was led by head coach Nick Saban. The Crimson Tide played Michigan State in the semifinals at the 2015 Cotton Bowl Classic, winning 38–0. 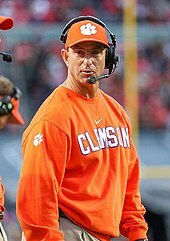 Clemson was led by head coach Dabo Swinney. The Tigers played Oklahoma in the semifinals at the 2015 Orange Bowl, winning 37–17. Alphonse Taylor RG Tyrone Crowder Jr.
Having won the coin toss to start the game, Clemson elected to defer to the second half. Characteristic of Alabama, the offensive opening drive was slow and cautious but notable for utilizing Derrick Henry four times, a change from the semifinal game against Michigan State. Alabama and Clemson would trade punting drives before, on the next Alabama possession, Derrick Henry was utilized three times. On the third run, Derrick found an opening for a 50-yard touchdown run (7-0). However, on the next two Clemson possessions Deshaun Watson used his speed, agility, and elusiveness to sustain drives with a mixture of QB runs and fade routes against Alabama's top-ranked defense. Both drives ended in TD throws to Hunter Renfrow (7-14), the latter of which ended the first quarter. On Alabama's next possession to start the second quarter, despite a promising start in a 29-yard pass to Richard Mullaney, Alabama's offensive line conceded a sack by Kevin Dodd and a tackle for loss on Derrick Henry. Characteristic of Alabama, facing third and long offensive coordinator Lane Kiffin opted for extra field position on a punt with a short throw to Ridley rather than attempting a first down pass. On the ensuing Clemson drive Deshaun Watson was intercepted by Eddie Jackson at the Clemson 42 yard line. The resulting Alabama possession culminated in a 1-yard TD run by Derrick Henry (14-14). After this flurry, both Clemson and Alabama played more cautiously as each of the three following possessions by both teams went no further than 40 yards. Clemson's last possession of the half resulted in a blocked field goal. On Alabama's first possession of the fourth quarter, Jake Coker found ArDarius Stewart in single man coverage for 38 yards. This gain, however, did not translate into a touchdown as the offense was stalled by good secondary play from Clemson. Alabama settled for a field goal from 33 yards to tie the game (24-24). On the ensuing kickoff Alabama gambled on a surprise onside kick, executed to perfection by Adam Griffith and caught by Marlon Humphrey. Alabama capitalized almost immediately with another 50+ touchdown pass to a wide open OJ Howard (31-24). Clemson pulled within 4 once again. However, Alabama's defense held in the red zone and forced a field goal from Clemson (31-27). On the ensuing kickoff, Alabama RB Kenyan Drake stunned Clemson by taking the ball 95 yards for an Alabama touchdown (38-27). Deshaun Watson quickly answered with an 8 play 75 yard touchdown drive which culminated in a 15-yard touchdown pass to WR Artavius Scott. In attempt to pull within three points of Alabama (and thus within a field goal of tying the game), Clemson attempted a two-point conversion with what morphed into a naked bootleg QB run by Deshaun Watson which was stopped short (38-33). On Alabama's next possession QB Jake Coker passed the ball in a checkdown screen to OJ Howard who, getting good blocking, ran for 63 yards. With less than 3 minutes left in the game, ran the ball up the middle to convert downs. After a key third down scramble for a first down by Jake Coker, Derrick Henry, on third down, broke the touchdown plane with the nose of the ball over the top of the goal line pile of players for a 1-yard TD run (45-33). A stellar performance by Deshaun Watson on a 55-second drive culminated in a 24-yard touchdown pass to Jordan Leggett with 12 seconds left on the clock (45-40). Clemson attempted an onside kick but the ball was recovered by Alabama sealing their victory. This was the fourth Alabama national championship win in seven years, first of the College Football Playoff era, and Head Coach Nick Saban's fifth overall. The game was broadcast in the United States by ESPN, ESPN Deportes, and ESPN Radio, with Chris Fowler and Kirk Herbstreit as English commentators on TV, and Eduardo Varela and Pablo Viruega as Spanish commentators. In Brazil, the game was broadcast on ESPN Brazil by Everaldo Marques (play by play) and Antony Curti (color commentator). As in 2015, ESPN provided Megacast coverage of the game, which supplemented coverage with analysis and additional perspectives of the game on different ESPN channels and platforms. An average of 23.6 million viewers watched the game, representing a 29% decrease over the 2015 title game, which was seen by 33.4 million viewers. The game was the sixth-highest-rated broadcast in U.S. cable television history (by contrast, the 2015 game was the highest-rated), and ESPN reported that the game brought the network its third-highest overnight ratings (behind the 2010 and 2015 title games). ^ "Alabama 6½- to 7-point favorite in title game vs. Clemson". FoxSports. Retrieved September 7, 2016. ^ "College Football Playoff Announces National Championship Pregame Entertainment" (Press release). College Football Playoff. December 17, 2015. Archived from the original on January 2, 2016. Retrieved January 1, 2016. ^ Volner, Derek (January 12, 2016). "College Football Playoff National Championship: ESPN's Third Highest Overnight Ever across All Sports; WatchESPN Sets New Records". espnmediazone.com. ESPN MediaZone. Retrieved December 4, 2018. ^ "Deshaun Watson has record night in national championship loss". Retrieved November 17, 2016. ^ Hutchins, Andy. "How Deshaun Watson became a superstar". SBNation.com. Retrieved November 17, 2016. ^ "Final AP Poll: Alabama finishes No. 1 for 10th time; Stanford, OSU move up". Sports Illustrated. Retrieved January 13, 2016. 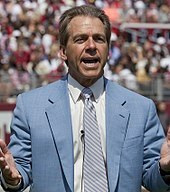 ^ "Alabama claims it has 16 national titles, but several are disputed". Sports Illustrated. Retrieved January 13, 2016. ^ "CFP National Championship Game Book" (PDF). January 11, 2016. p. 21. Retrieved January 20, 2019 – via rolltide.com. ^ "ESPN brings the Megacast back for the College Football Playoff National Championship". Awful Announcing. Retrieved January 8, 2016. ^ "Details for ESPN's Megacast of the College Football Playoff title game". Sports Illustrated. Retrieved January 8, 2016. ^ "ESPN College Football Title Game Ratings Drop 19% From 2015 Record". Broadcasting & Cable. NewBay Media. Retrieved January 13, 2016.